Solidarity from the east German countryside. Photo courtesy of the author.Dear fellow farmers and peasants in Syria, dear people in Syria and those connected to its cause, – as food concerns us all, hunger and oppression feel the same to each and every person. When we were approached to write a public letter for you, I felt rather humbled and not knowing where to start. As a farmer and as someone who has encountered the gratitude and witnessed the Sumoud of the Syrian people, I am ashamed of the hardships you are in and ashamed, knowing your strength, that you have been left to fight alone while the weakness of the world is just standing by. Who am I, or any of us out here, to write any lines to you other than those couched in deepest humility. I am a simple farmer from the worldwide movement of the farmers and peasants, La Via Campesina, which in translation means the path of the farmer. The struggle for food sovereignty begins at our doorstep: when i work the fields on my farm i am actively engaged in the local movement against landgrabbing of agricultural lands in my region and the use of poisons and pesticides.This work is not separate to my direct solidarity with Syrians, and is as necessary. Policies of land grabbing, theft, destruction and displacement happen in a 'globalized' setting, and such must be our resistance. We know that in Syrian society, as in all societies, agriculture and food production play a crucial role. We know that a huge number of Syria’s poor, many of those who demanded justice, dignity and bread from the start of this brave revolution were actors from the rural areas and workers in the production of everybody’s needs: food production. We also know of the oppression that the regime embodies and the tactics of neoliberal destruction it had already launched against Syria’s agriculture long before the revolution was even dreamt of. As many other powers do globally, so the Syrian regime also subdues Syrian society by keeping its food production under its control. It made sure to collect the seeds and distribute them in the next season for its own wellbeing: bad seed or none to those it wanted to punish politically and to the rest over the years it would give in return for the local inherited seeds those modern types that best served its own neoliberal interests. Syria has long concentrated on centralizing its food production, collecting grains and keeping central control over the mills. These steps once achieved, it is a relatively easy task to subdue the people: whether for the sake of the profit for a few or as a political punishment and more generally a form of control. We have also heard the stories of those who have risked their lives and hid seeds from the regime’s hands in the past. We have heard of the profit the regime has gained at the cost of Syrian farmers, Syria’s nature, earth and water when it years ago started to push, for example for cash crops such as cotton, implementing the whole path of western indoctrination against the agricultural industry and simply going along with the maximum exploitation of the deep water reserves, using mineral fertilizers, pesticides, herbicides and all other kind of chemicals. All these steps led to an agriculture and a food production deeply dependant on governments or international enterprises, in any moment of crisis leading to an immediate influx of hunger. This destruction of our livelihoods is something we as farmers witness globally and also globally we fight it. You have started down a path of full liberation from a draconian regime and thus face the most extreme violence from all sides. We must understand that your liberation is the liberation of us all: it shouldn’t matter merely to Syrians. We know, for example, that many of the weapons used against you in your present struggle for freedom and future are weapons potentially and really used against us all. The importance of the agricultural heritage of this whole region is something we as a people globally must understand. It was in the ancient Mesopotamia where human kind first started to breed grains for food. The Iraq war was one of the clearest examples of how the situation of war is being used by the powers to gain control over local markets and over whole populations: first they bombed the seed bank in Abu Ghraib and thus forever buried the most extensive samples of human kind’s seed history. The genetic diversity that has been destroyed in this attack would be - if still in existence - the best weapon against hunger when the high tech seed bred out of the laboratories of the great powers cannot rise to the challenge of pests, difficult climates or different types of soil. They have destroyed this treasure for their own benefit: the new set of laws implemented on Iraq by the US administration now forbids the growing of traditional Iraqi seeds and pushes for the seeds of some of the few seed companies in power worldwide to grab hold of Iraq’s seed market. It should be mentioned that Monsanto, one of the biggest of these companies had the violent private military group ‘Blackwater’ working for them. Seeds are systematically stolen in wars and it should also be mentioned that from the seed companies only four already control up to 75% of the world markets. They are direct beneficiaries of wars and come through various paths: by the armies of nations and regimes, or sometimes hidden in the shadows of big humanitarian aid agencies, bringing the promising relief to local farming in the form of their seeds and chemicals. It is the farming of our grandmothers and –fathers that is under attack and it is this farming of this sustainable and diverse character – not necessarily with the same traditional social implications endured by our ancestors - but an agriculture connected to its people and nature, that has fed the people over the past ten thousands of years and that is the key to self-determination and freedom. The poverty and thus resulting migration of the people from Syria’s “cottonized” regions into cities’ poor neighborhoods the past years is just one example of the outcomes of the regime’s neoliberal agricultural policies. The loss of ground water and fertile soil will long be a challenge to these areas. The loss of control over seeds or means of further processing agricultural goods, such as turning grains into flour, have made it easier for the regime to punish large regions with starvation and will in the future make it altogether easier for foreign powers to grab hold of Syria through this dependant state that people are in. Hunger and food is an ugly tool used against us all. So the defense of our foods is and must be part of our daily resistance. While we embrace you from afar, we are sharing these words with you as we fear for your power to stay steadfast when facing such dangers in addition to the terrible dangers you are already facing. As simple farmers we do not come with the money and forces of a big aid organization. We too have not much more in our hands than the tools with which to work the soil under our feet. We cannot and will not make big promises or meet you in five star hotels somewhere abroad. What we want to offer is the work of solidarity as you face the challenges you face, as we increasingly understand them as a collective challenge. We want to offer you our knowledge about the powers that in some of our countries have already attacked us and our foodstuffs. We want to learn from your knowledge and skills on how you face these attacks. We want to invite you to join our global movement of peasants’ solidarity and we want to join your work and resistance for your local bases. We, we represent a few of the global peasants movement, La Via Campesina and some of us started work in Syria with the first few of your fellows, on the movement called “The 15th Garden”. This name reiterates for us what we feel a farmer’s hands can do: join the call of the Syrian revolution which sprung to life on March 15 three years ago and build gardens throughout Syria as part of this resistance–full of the diversity of kinds and traditions that the Syrian soil is capable of. Not all of us are farmers too. Some activists who have never had any contact with agriculture have nevertheless started to understand the need for food sovereignty, when the weapon of hunger is a tool used against people. The regime has already chosen this form of repression, to fight our revolution by starving people in Syria. When this happens, it is only logical that activists must as a consequence becoming farmers: “The soil that you work is yours.” Thus the revolution means that people may have an opportunity to get closer of what belongs to them. As some friends from a community garden put it: “It might even be a step further than any thing you will find either in the opposition- or regime-controlled areas. The moment your hands touch the ground and the community joins as a collective feeding itself from there in solidarity, this ground is liberated and belongs –just and only- to the community.” This is what we have recognized in Syria and it is this insight that allows us to extend our solidarity. The 15th Garden has started to grow from these seeds. It is the network of projects of food sovereignty –of a free food for a free people- in Syria. Here we meet as community gardeners and farmers from throughout the country and abroad. It is the farmers and the city gardeners, it is the refugees who have fled, but carry the soil and the spirit of Syria under their feet when they are determined to produce life even in the furthest camp town afar. As such, we offer knowledge from the simplest questions on how gardening is actually done (for those who are new to it) to the bigger questions of how our communities organize better through their need to produce food, or which support can we offer for you from afar. It is farmers and gardeners from abroad, who might not have known a single person from Syria were it not for this connection can build a mutual understanding on this civil basis. The 15th Garden is a network of a growing number of urban and community gardens in liberated areas in Syria, and of urban gardens abroad standing in solidarity and in direct contact for skill sharing with them. 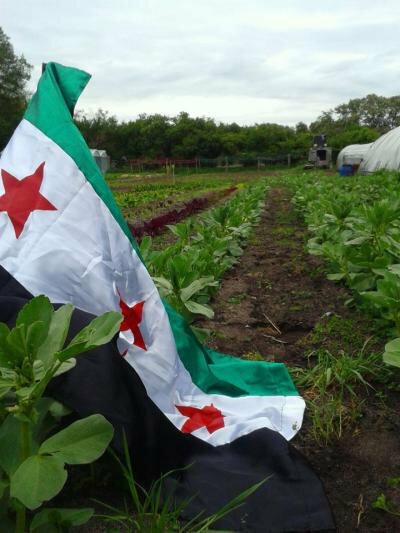 It is a platform for gardeners and farmers alike in Syria to stand together, exchange skills and develop a sovereign food production for the people of Syria, connecting this goal with the demands of the revolution for a free and diverse Syria. It involves meetings and workshops in Syria and and the neighbouring countries, and doing the actual work of food production together, across the areas and putting the struggle for a free Syria in the context of global peasants resistance. The 15th Garden works on sustainable seed exchange and building the knowledge to reproduce sustainable and free seeds and all other methods of farming that a free people need for gaining their self determination. Feel free to contact us and join the network!